An ombre cake is made up of several layers of cake that are all of varying shades of one color, creating a beautiful look when the cake is sliced. To make an ombre cake, you'll need to separate the cake mix into separate bowls so that you can mix in different amounts of food coloring. Bake the cakes until they're done, and then stack them on top of one another to create the gradient of color before icing the final cake. 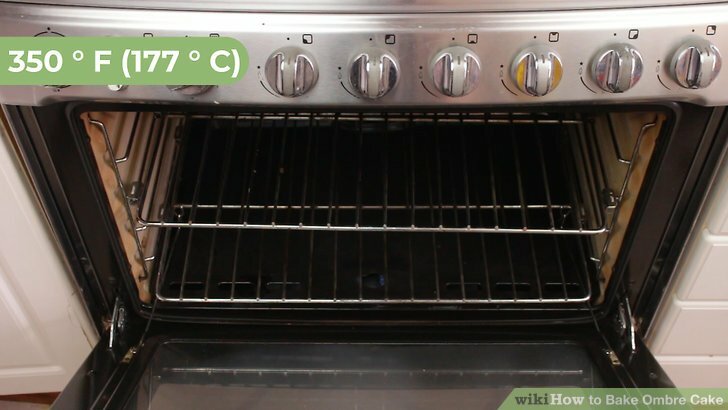 Preheat the oven to before preparing white cake mix. Purchase a white cake mix from a grocery store or big box store and follow the directions to prepare the batter. Stir the batter well in a large bowl so that there aren’t any big lumps. If you’d rather make your white cake mix from scratch, find a recipe online or in a cookbook. Your cake mix will likely require ingredients such as eggs, water, and oil. Decide how many layers your ombre cake will have. Your cake should have at least 3 layers so that the color change is evident in each layer, but you can choose however many you’d like. How many layers you bake may depend on how many matching cake pans you have, as you’ll want each layer to be the same size. 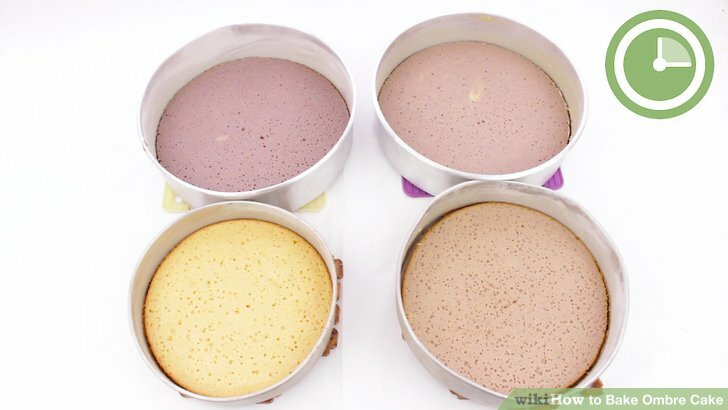 If you have three cake pans that are all the same size, decide on a three-layered ombre cake. 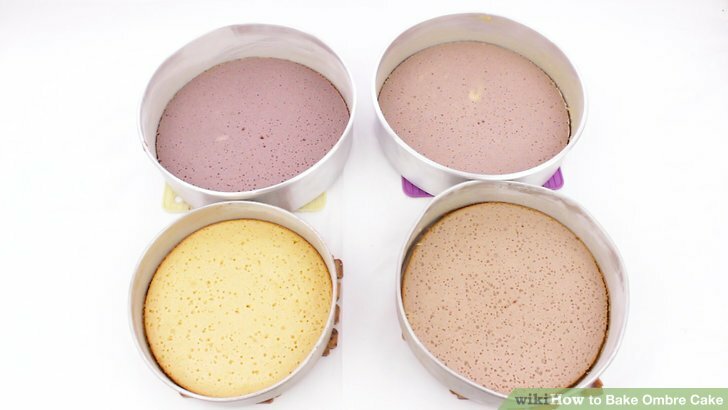 If you want 5 layers but only have 2 or 3 cake pans, you can always cook the cakes in separate batches in the oven. 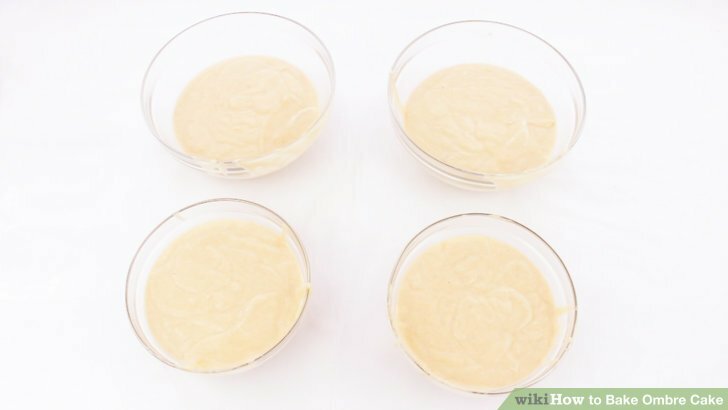 Divide the cake batter into the needed number of bowls. Once you’ve chosen how many layers you want, pick out the same number of bowls to separate the batter. Pour the cake batter into each bowl, separating it into equal amounts. For example, for a cake with 4 layers, separate cake batter into 4 separate bowls. To help you distribute the batter evenly, put scoops of batter in each bowl one at a time. Set one bowl of cake batter aside that will stay white. This bowl will be the lightest, top layer of the cake. Make sure no food coloring goes in this bowl by setting it to the side so it's ready to go straight into the baking pan. Add 1 drop of food coloring to the next bowl of cake batter. Pour a drop of your desired color of food coloring into a new bowl of batter. Use a very small amount, as this will be the second lightest batter color. Mix the food coloring in with the batter using a spoon. For example, if you’re making a blue ombre cake, pour a small drop of blue food coloring into the bowl and mix it in. Continue adding larger amounts of food coloring to the remaining bowls. In each remaining bowl, add a larger amount of food coloring to create a gradient of color with the batter. The last bowl of batter should be the brightest and darkest color, while the other bowls should each be slightly lighter. If you’re making a pink ombre cake, the last bowl of batter would be a dark pink, then a regular pink, a light pink, and finally the last bowl would be white. Mix each bowl of batter thoroughly with the food coloring so that the color is seamless. Grease or add parchment paper to your cake pans. You can either rub butter in the pans, spray them with baking spray, or cut pieces of parchment paper to fit in each pan so that the cake doesn’t stick to the bottom. Do this with each pan that you’ll be using. If you’re reusing the same pan multiple times, make sure you grease it each time you use it. Pour each bowl of batter into a separate cake pan. Pour the first bowl of batter (the one without food coloring) into the first cake pan. Continue doing this with the rest of the bowls of batter, spreading each color into its own pan so that the batter is evenly distributed throughout the pan. Bake the cakes for the recommended amount of time. The specific baking time will depend on how thick the cake is and the size of the pan, but refer to the instructions on the box or in the recipe for more specific times. When you think the cake is close to done, stick a toothpick in it. If the toothpick comes out without any batter on it, the cake is done. It’s a good idea to start checking on the cake after it’s been baking for 10 minutes. Make sure you check each cake to see if each one is done cooking. Let the cakes cool for 5 minutes before removing them from the pans. This will make it easier to remove them without them falling apart. Use a knife to loosen the edges of the cake from the pan before flipping the pan over onto a plate or cutting board. Do this with each cake, being careful not to let the cakes fall apart. If you want the cakes to cool even faster once they’re removed from the pan, wrap them in plastic wrap and put them in the freezer for 10-15 minutes. Make the tops of the cakes level using a bread knife. Use the bread knife to carefully cut off the top of the cake that puffs out and forms a dome. By removing the top of the cakes, you'll create a level surface and it'll be much easier to stack them evenly. While you don't have to do this to the top layer of cake, it will make your cake look more professional. Place the first layer of cake on a plate topped with icing. The first layer to go on a plate should be the darkest-colored cake. Use a knife or offset spatula to add icing on top of this cake, which will serve as an icing layer in between the stacked cakes. Spread the layer of icing thinly and evenly so your cakes stack well. Use a white icing in between each layer. Stack the rest of the cakes with similar layers of icing in between. Once your darkest-colored cake is placed and has icing on top, add the next lightest cake color to the stack. Add a thin layer of icing onto this cake as well, just as you did with the first layer. Continue doing this will the remaining cakes, making sure the cakes are in the right order so that they create a gradient of dark to light as the cake grows taller. If you’re making a green ombre cake, the darkest green cake would go on the bottom and each cake that goes on top would be a tiny bit lighter, with the lightest cake going on top. Add a thin layer of icing over the entire cake to catch the crumbs. While you don’t have to do this, it will help you create a smooth final layer of icing. Use an offset spatula to spread a thin layer of your desired icing over the entire cake, going around the cake to create an even circle. This thin layer doesn't need to be perfect, as it won't be seen under the final layer of icing. Place the cake in the fridge after you do this for 15 minutes to help set the icing faster, if desired. Frost the cake with a single color of icing for a quick covering. Cover the cake in vanilla frosting using an offset spatula to create a smooth layer around the whole cake. If you’d like the icing to match the color of the cake, use the same food coloring to dye the icing one color before spreading it on the cake. For example, if you created a purple ombre cake, use purple food coloring to dye the icing purple before spreading it evenly over the cake. Create ombre frosting by using several different gradients of frosting. If you want your icing to match the gradient on the inside of the cake, separate the icing into separate bowls just as you did the batter before adding food coloring drops to the icing. Spread the darkest shade of icing around the bottom of the cake, working your way up with lighter shades until the whitest icing is at the top. You can use the same number of bowls as you did layers of cake, or you can choose a different number of bowls, if desired. Try filling piping bags with each different gradient of icing to easily spread the icing around the cake. Use an offset spatula to blend the icing gradients, if desired. Slice the cake to begin serving it. Once your cake is finished and you're ready to eat it, use a knife or cake server to cut a slice and place it on a plate. If you have leftover cake, put plastic wrap over it and place it in the fridge. You can also put the cake in plastic containers that are sealed to keep it fresh. Your cake should last roughly a week in the fridge.